Welcome to the fifth blog in our ‘get to know you’ series, this time it’s the turn of……. I’ve been in this role since April 2013, so at the time of writing nearly 18 months. 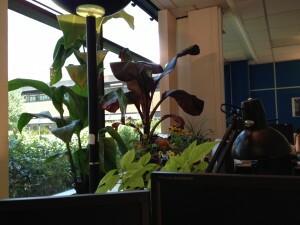 I’m based in room A20 at the Kings Meadow Campus and have a lovely view of the ponds and fountains. View from my seat towards the banana plantation! I’m the Project & Systems Co-ordinator for a European Regional Development Funded (ERDF) project, called Building Enterprise, based within the Access and Communities team. The project is aimed at assisting socially focused small businesses and eligible 3rd sector organisations that are based in Nottingham. The support mainly takes the form of providing a postgraduate student to undertake a specific research and development project with the organisation. The project is also delivering a series of knowledge transfer workshops covering a wide range of topics from technology to organisational development. I really the enjoy the fact that I am involved in a project that hits two targets with one stone. We are helping organisations that are in desperate need of this kind of intervention and also giving students invaluable experiences and increasing their employability skills – all in one action! I started my working life with the National Coal Board, subsequently British Coal, in the late 1980s. My career with British Coal took me to a range of departments and locations, with my final post being that of Senior Finance Officer in the Management Accounts team, based at the British Coal Opencast headquarters. I took voluntary redundancy, during the privatisation of British Coal, and started a career within Local Government with Mansfield District Council. My career in Local Government lasted 18 years and involved working at Derby City Council and Ashfield District Council, as well as a partnership project that covered Bolsover District Council as well. I can’t say that I’ve ever had an unusual job, but I do have some funny memories from over the years. One in particular comes from a tour underground I had at Linby Colliery, when I worked for British Coal. It was quite surreal to be 500 feet underground and sitting at the side of an old miner on a ‘man-rider’ train, chatting about the chewing tobacco he was happily chewing, with him occasionally pausing to spit between chews – he said it was a good method of getting rid of all the coal dust from his mouth, there was certainly a lot of coal dust down there, so I never doubted his belief. When I get home I paint tiny little blue European funding logos all over my ceilings and walls. See how I relax above.